Organizations using the internet to connect with their Chinese offices should be deeply concerned by that announcement. Starting this April, branches in China will no longer be able to communicate outside of China within their private secured corporate network (VPN). 1. Order an MPLS link from your branch office to your corporate. This solution takes much time and resources to fulfill and may not be optimal for most organizations who are not well prepared for it in advance. 3. Use Internet Binat and Aryaka private network to bypass the traffic directly and securely to your headquarter or main office in just a few days. Option 1 (MPLS) involves 3 to 6 months for the installation of a line. Option 3 is the best way to go and the ONLY REAL SOLUTION for your global communication in and outside of China. With our communication junctions located in China and connected with dedicated fiber links, we are able to connect any China branch to your head office (or vice versa) in a secure and stable way. The only requirement on your side is an internet connection on both ends. 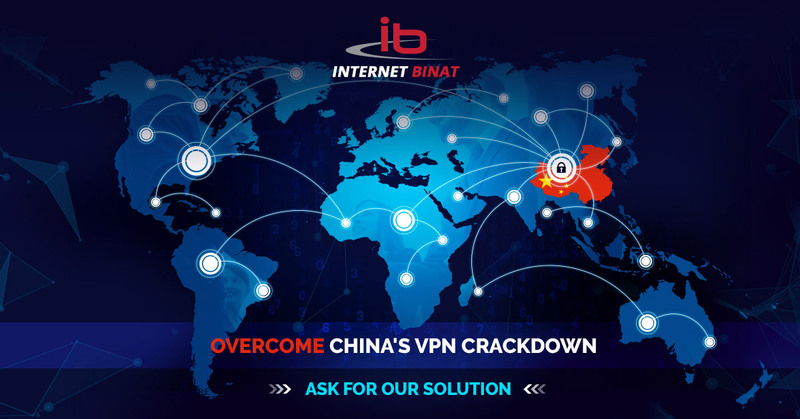 Keep your corporate secrets safe and work with your China branch – Contact us and receive all the information and tools to help you overcome China’s VPN crackdown. To learn more about how we help fill these gaps and secure more efficiently, and to run a free security preview, click here.